FRAMINGHAM – The Natick Red Hawks defeated the Framingham Flyers girls swim and dive team 93-87 Tuesday afternoon at Keefe Technical’s pool. The Flyers are now 7-4, under head coach Mike Foley. 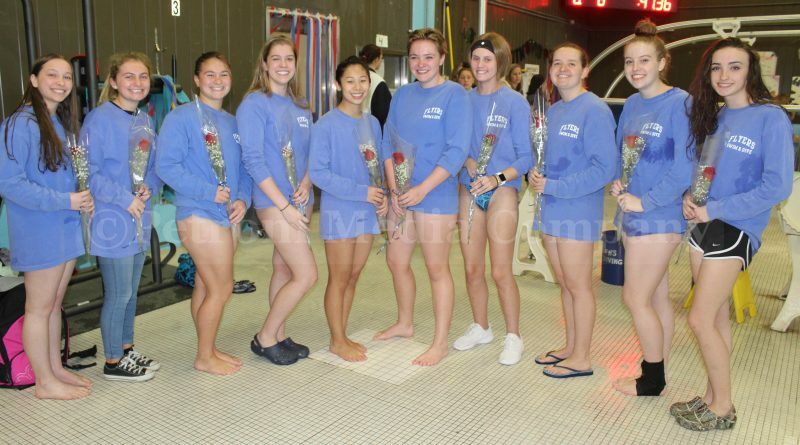 During the meet, the 10 seniors on the Framingham team were honored. They were: Halia Bower, Emily Canty, Kalena Chin, Samantha D’Ercole, Julia Long, Kara McCurdy, Olivia Nelson, Catherine Turner, Niamh White and manager Shoshanna Buck. Natick opened the meet with a 12-2 lead finishing first and second in the medley relay. Natick swimmers Hannah Batt, Abby Chen, Bridgette Grothman and Sarah Doherty finished first in 1:58.60 minutes, a time that qualifies them for the state meet. Framingham swimmers Carolina Mazariegos, Emily Rogers, Olivia Nelson, and Marley DeSimone finished third. Bower won the diving competition for Framingham. Turner tied for second place with Grace Chouinard. Framingham’s Chin finished fourth. All three are seniors. Natick sophomore Emma Koskovich finished fifth with 156.45 points. 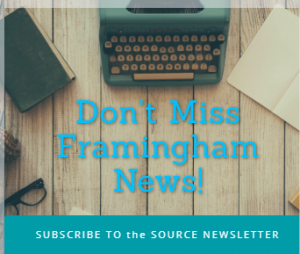 The only other event Framingham won yesterday was the 50-yard freestyle. Sophomore DeSimone touched the wall first. Samantha Fuchs finished second in 26.94 seconds for Natick. White was fifth for the Flyers. Batt won the 200-yard freestyle for Natick in 2:01.86 minutes. Sophomore Jessica Tosi and Jillian O’Neil finished second and third for the Flyers. Long had a strong swim for Framingham to finish fifth in 2:13.74 minutes. Grothman won the individual medley in 2:17.64 minutes, which qualifies her for the state meet. Framingham sophomores Mazariegos and Tatum O’Leary finished third and fourth in the event. Both qualified for the state meet. Grothman also won the 100-yard butterfly event for the Red Hawks. om 1:03.27 minutes, a state-qualifying time. Framingham captured third, fourth and fifth place in the event. O’Leary was third, Mazariegos fourth and senior Olivia Nelson was fifth in 1:07.05. Natick’s Doherty won the 100-yard freestyle in 57.22 seconds. DeSimone finished second for the Flyers. Sophomore Suzanne Julakis had a strong swim to take fourth place in 59.88 seconds. The Red Hawks Batt won the 500-yard freestyle in 5:23.84 minutes. Framingham’s McCurdy won the state title in the 500 last year, but is out sick this season. Senior Long finished second behind Batt in 5:54.90 minutes. Junior Casey Libuda finished third in 6:15.61 minutes and freshman Sabrina Tersoni finished strong to take fifth place for Framingham in 6:21.76 seconds. Natick won the 200-yard freestyle relay in 1:46.93 minutes. Framingham swimmers White, Jessica Tosi, Mazariegos and DeSimone finished second. Natick also took third in the relay. Doherty won the 100-yard backstroke for the Red Hawks in in 1:06.85 minutes. Freshman Sophia Wong finished second for Natick in 1:07.03 minutes. Framingham senior Nelson finished third in 1:08.49 minutes. Sophomore O’neil finished fourth for Framingham. Freshman Helen Zhao won the 100-yard Breaststroke for Natick in 1:14.15 minutes. Framingham junior Rogers finished third, with sophomores Arielle Shek and Maria Martinez taking fourth and fifth place. Natick won the final event of the night, the 400-yard freestyle, in 3:53.53 minutes.